One of my favorite Old Testament books is Nehemiah. This book has so much to glean, from rebuilding your life, your faith, your church, your community, your leadership skills…the list goes on and on. Today, let’s talk about prayer. Prayer is essential in your daily life. Key word: Daily. Prayer can do many things. When I pray it builds my faith and dependence on God. It feels good to dump all the things I’m concerned about on Someone who can actually fix me…and the issues. I don’t always see immediate results to my prayers. I don’t always get the answers I want. But God is listening and answering. His way. His time. And if I sit still long enough, I’ll hear Him talk back. Through Scripture. Through ideas that come to mind. Many different ways. Nehemiah was the king’s cupbearer. He was a trusted servant to the king. And at this time, many were going back to Jerusalem to rebuild what had been torn and burned when God’s people went into captivity. Nehemiah needs success. He’s about to speak to the king and ask to go back to Jerusalem to help rebuild. 1. Permission: Nehemiah was granted access, permission to accomplish God’s will and to be used by God. When we come humbly before God with His glory and purposes in mind, we’ll find permission from Him and He will grant us access. But it doesn’t stop there! 2. Provision: God didn’t just give Nehemiah favor with the king to grant him earthly permission, but He saw to it that Nehemiah had all the provision he needed to set out and accomplish the God-glorifying task at hand. You never need to doubt provision and resources when God gives you permission to move forward. Whether it’s a new job, ministry, move…if God allows it, He won’t set you up to fail but always to succeed! Also a side note: remember to ask for anything! “You have not because you ask not” (James) Who knows what God will grant you, but you can be sure you’ll never receive it if you don’t at least ask! 3. Protection: God made sure to protect Nehemiah on his journey. Now let me make a note to state this, I am not saying that if God calls you to something that you won’t ever get sick, or struggle, or your car break down. Sometimes that’s part of the faith-journey–trusting God through it all. Even Nehemiah faced serious adversity and opposition, to the point they were building with one hand and holding swords with the other. But there is a measure of supernatural protection. Those men never killed them or defeated God’s purposes, even when they threatened it. Whatever God is asking you to do, know that if He’s calling you to it, He’ll see you through it. Have you signed up for my newsletter? A new novella is coming to subscribers on April 2nd for a limited time. Grab the chance and sign up by clicking on the Sign Up page above. If you haven’t read Hope Under Mistletoe, it’s available on Amazon for only $2.99! It centers around Christmas but can be read anytime! If you’re not part of my FACEBOOK page, I’d love for you to join me for daily inspiration and plain old fun conversation. CLICK HERE! We’re tacking on verse 12 to our passage. a richer meaning, then apply it to ourselves in the context of humility. despise him through jealous eyes. Many years David ran from Saul. He hid in caves. He had no rest. And many of his Psalms were written during this time. trusts Him and ends here with the fact he will wait for God. see the pain taken away, the dreams fulfilled fill-in-the-blank. tired. We grow faint. We stop praying. Maybe, just maybe, we stop believing. reminded of David. After he and Bathsheba committed adultery, their child died. man to live, a son had to die. and I to have the hope we do, a Son had to die. continually keeps us low and brings God high. Rightfully where He belongs. for doing right, you are blessed. honest and vulnerable before Him. Trust Him to know best. respect you. We rejoice and give thanks for the amazing rescue of our souls. is one thing you can rejoice about today? 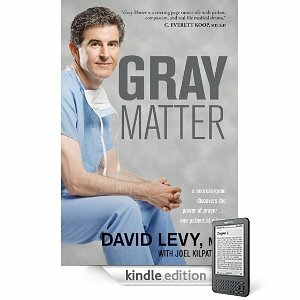 Dr. David Levy tells his story through the pen of Joel Kilpatrick. 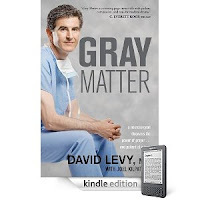 Dr. Levy didn’t start out knowing he wanted to be a neurosurgeon. He started out as a mechanic. He was good at fixing machines, and what machine is as beautiful and complex as the human brain? He excelled through his classes, the typical overachiever, and was glorified by peers and colleagues. But something changed in Dr. Levy. That “something” was a Someone. God. So…what if he brought prayer into health care? He grappled with the idea. What if he was rejected? Belittled? Humiliated? Yet he took the chance and started what he knew God wanted him to do–asking patients if he could pray with them before surgeries. This book describes not only his procedures, which are explained easily for gals like me to understand and are incredibly fascinating, but it details the outcomes physically and spiritually. Some physical symptoms experienced by patients had no medical cure –but the spiritual cure was forgiveness. Bitterness, hate, and resentment, doesn’t just effect the mind but the heart. These emotions can cause physical ailments and debilitating symptoms. Some of Dr. Levy’s stories are his experiences helping patients find Jesus and experience forgiveness as well as helping lead them to forgive others. It was beautiful! Don’t expect every single procedure to be miraculous in this book–not all were– and I like that. He doesn’t sugarcoat anything, but what God did in the lives of the patients, families, and Dr. Levy are remarkable. No, not everyone verbally showed that they’d been moved by God, but that’s real life. We don’t always know how we touch others through simple prayers or our behaviors that reflect Christ. If you question how effective prayer is, read this book. If you’re interested in amazing, complex neurosurgery, read this book, or if you simply need uplifted, encouraged, and hope–read this book. Thanks, Tyndale for giving me this book complimentary for review purposes! For a limited time, it’s FREE on kindle! Click HERE to get it! If you don’t have a kindle or just want the feel of a book in your hand, I’m giving away a copy of Gray Matter! To enter: Answer the following question in the comments section below. “What kind of doctor would you be and why?” You have until Tuesday evening to enter into the random drawing. I will post the winner on Friday.